Wednesday, December 11th at 6pm at the Village Inn in Monte Rio. The menu will be a choice of traditional turkey dinner or vegetarian entrée. The Chamber asks diners to support River to Coast Children's Services by donating gifts for teens...gift cards and items bought locally are preferred. The gifts will be collected at the dinner. And yes, we will be having our usual 50/50 cash raffle! Tickets are $20 and are available at the Chamber Office. Please purchase before November 30th. For more info, contact the Russian River Chamber of Commerce at 707-869-9000. See you at the Village Inn! 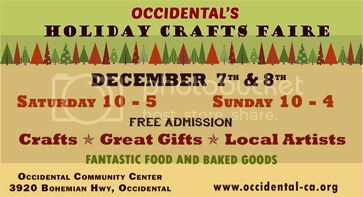 Please join Fawn from the Gene Gaffney Team at Occidental's 28th Annual Holiday Crafts Faire. Enjoy wonderful food, baked goods, gifts, craft adn local artisans... A great way to shop local! The event will be held at the Occidental Community Center, 3920 Bohemian Hwy., Occidental. Do you like cumbia? Want to celebrate the recent immigrant rights victories of California? Then come celebrate with the Graton Day Labor Center (Centro Laboral de Graton) at the Arlene Francis Center of Santa Rosa! Bring your dance on and enjoy Saturday Dec 7 with us. There will be food, beer, and wine available to accompany the night. The featured art show will be from Crystal Celeste, local artist, in the house! What better way to celebrate the immigrant rights movement than with culture and music! Hord d'oeuvres! Refreshments! Shopping! Joyful caroling! Santa Claus pictures at Guerneville Parcel Box Plus! Raffle tickets are available at sponsoring businesses. $300.00 Cash Price! 6-9pm at Chef Patrick's Restaurant. RSVP to Beth Rudometkin by Monday, Dec 2 at 707-869-9063. This year's theme: Lights! Camera! Action! Parade of Lights goes Hollywood! Parents, caregivers, and communities play an important role in creating stable, safe, and nurturing environments that protect our children and youth from violence and abuse and its consequences. You will learn specific positive discipline techniques to promote children's social skills and anger management as well as learn about the role of electronic media on violence. Most importantly, parents will learn how to become protectors and advocates at home and in their communities to help protect children from violence. ATTENTION WEST COUNTY BUSINESS OWNERS! Join Angela Gianni from the Gene Gaffney team at a very important panel discussion. This Americans with Disabilities Act (ADA) Accessible Panel will provide you with information about making your business location ADA compliant and purchasing insurance for this risk. The panel will be meeting at the Russian River Fire Protection District (Guerneville fire house) 14100 Armstrong Woods Rd, Guerneville, CA; for more information please contact Margaret Kennett at Fern Grove 707-869-8105. Come share a festive day at Woodfour Brewery (6780 Depot St., Sebastopol) with Angela from Gene Gaffney Insurance Services and C.A.F.E. (Conservation Action Fund for Education). CAFE educates, empowers and engages the Sonoma County community around issues of sustainability and the environment. Suggested donation of $25. New Acquisition for Gene Gaffney Insurance! 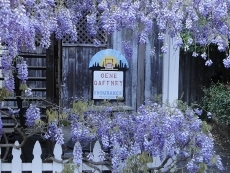 Peggy Holloway, owner of Hollow Insurance Agency, is pleased announce to the successful sale of her business to long time Sonoma County institution Gene Gaffney Insurance Services. Peggy’s goal was to find an agency with an established commitment to customer satisfaction and decades of local insurance experience. She is confident that her clients wil...l be happy with the customer service provided by GGIS and will be impressed by the additional insurance solutions that GGIS can offer. GGIS has been serving Sonoma County since 1978 and we have an intimate knowledge of the area and the uniqueness of its landscape, population, properties and insurance challenges. We provide an unprecedented level of insurance expertise and our friendly team can quickly and accurately assess your needs, evaluate the offerings from multiple, top-rated insurance carriers, and present you with a custom-built plan to solve your insurance needs at a reasonable price. Fawn Nekton is the President and Owner of Gene Gaffney Insurance Services. She purchased the agency from her father in 2010 and has worked at GGIS for more than 20 years. She is recognized as an expert in personal, business, specialty and non-profit insurance. She is an active leader in the community and serves on many local commissions including the Occidental Community Council and the Harmony/Salmon Creek school board. The GGIS staff is also made up of dedicated community members that participate in many local business and community organizations. We don’t just work in Western Sonoma County, we live and play here. On Thursday, May 24 David and other team members from Gene Gaffney Insurance will be at Sebastopol’s Business After 5 mixer. This fun event will be at the Sebastopol Center for the Arts from 5:30 – 7:00. Come view great art from the Art a...t the Source artist’s gallery show; delicious food provided by co-host Whole Foods and wonderful wines poured by Sunce Winery and Moshin Vineyards. The Art Center is located at 6780 Depot Street. It's always well attended and a fun evening so stop by and network. Gene Gaffney Insurance Services is proud to be a sponsor of the California Parenting Institute (CPI) and Prevent Child Abuse-Sonoma County (PCA-SC). Every April, PCA-SC hosts a series of events throughout the month to recognize the importan...ce of child abuse prevention. The Blue Ribbon Awards are presented to members of our community who have made a difference in the area of child abuse treatment, intervention or prevention. These important contributions will be recognized on April 25, 2012 at the Mary Agatha Furth Center, 8400 Old Redwood Highway in Windsor. According to Sonoma County Child Protective Services, each year there are over 10,000 calls to the child abuse hotline with questions and reports of child abuse. In 2010, there were 2,613 reports of child abuse serious enough to require a face-to-face investigation to determine if allegations of abuse were substantiated and 199 children were removed from their home. Come join the gang from Gene Gaffney Insurance Services at the 4th Annual Russian River Chamber of Commerce Business Expo. The event will be at Buck’s Restaurant in Guerneville on Wednesday 3/28/12. This is an opportunity to meet all of the local business that support our community. Come by and say to Fawn and GGIS team! Please join Fawn and Angela from Gene Gaffney Insurance at the West County Health Centers open house on Friday 2/23. The program for the evening will begin at 5:30pm. Come enjoy light refreshments, wonderful company, delightful conversations and tours of our facility and of the Russian River Dental Clinic. Presenters will include Dr. DeEtte DeVille, RRHC Medical Director; Dr. Stephen Chadwick, ...Dental Director; and John Kornfeld, WCHC Board President. West County Health Centers envisions a community where all residents have a medical home and people are empowered to build healthy lives and communities. Please visit our website www.wchealth.org to learn more. Visit with Angela of Gene Gaffney Insurance at the Sebastopol Chamber of Commerce’s "BUSINESS AFTER 5” mixer on Thursday 3/22. This is a great opportunity to network with local West County business and community leaders. The event will start at 5:30 at “The Legacy” at 781 Gravenstein Ave. Hope to see you there! Join Fawn, Owner of Gene Gaffney Insurance Services, on Wednesday 3/7 at the Russian River Chamber of Commerce Mixer. This month’s event will be held at Korbel on River Road in Guerneville. This is a great opportunity to meet and network with local business and community leaders. Come by and discuss your insurance needs with Fawn and let her solve your problems. See you there! Join the folks from Gene Gaffney Insurance for “Give Back Tuesday” on 3/6 at the Rainbow Cattle Co. in Guerneville. This buffet dinner will benefit the Community Clean Water Institute. 10% of the bar proceeds plus the dinner and raffle sales will help the Institute support healthy rivers and the fish population. Dinner is only $5 and fish friendly and sustainable wines will be sold. The fun starts at 6pm - come by and say “hi” and support this great organization. Angela and David from Gene Gaffney Insurance will be at the Russian River Chamber of Commerce mixer tonight, Wednesday, January 11th at Main Street Station Pizza Cafe in downtown Guerneville . The fun starts at 6pm, come enjoy hors d'ouevres, good conversation, business networking and a special welcome from the new RRCC President, Laura Wilson. See you there! Join members of Gene Gaffney Insurance Services on Thursday December 1st at the “Lights of Life” celebration in Sebastopol. VNA Hospice and The Sebastopol Area Chamber of Commerce present a Holiday Celebration in the Plaza from 5pm to 8pm. We will light the tree around 6:30 and there will be plenty of entertainment and fun! See you there! David from Gene Gaffney Insurance Services will be at Marimar Estate Vineyards and Winery on Thursday evening (11/17) at the annual S.H.I.N.E Reception. SHINE stands for Sebastopol Honors Industry and New Enterprise. The Sebastopol Chamber is the only chamber in the County that holds an appreciation reception for all businesses that have taken out business licenses or changed ownership in the previous year. The chamber, with the City of Sebastopol, wishes to welcome them to the business community. Additionally that evening, the Chamber will provide recognition to members of long-standing status. Some members have been supporters for more than 20 years! "It is important to not only acknowledge new businesses on the scene, but to show appreciation for those that have been around for awhile. Many of them have been and continue to be the cornerstone of the Chamber's history and success for the past 90 years!" stated Executive Director Ramondo. The reception will be at Marimar Estate Vineyards and Winery, 11400 Graton Road, outside of Graton from 5:30 - 7pm. Please come to not only applaud years of service, but to meet new businesses and new clients. What a great opportunity to mix, mingle and sip some great wines! Come join the gang from Gene Gaffney Insurance Services and help celebrate the 35th anniversary of River to Coast Children’s Services on Wednesday November 9th from 6-8pm. The open house will be at 16300 1st Street in downtown Guerneville. You can get more information at www.rccservices.org. See you there! On Friday, October 28th Fawn Nekton, President of Gene Gaffney Insurance, will be attending the Forestville Chamber of Commerce Business Mixer at the American Wine Building in Forestville. There will be appetizers, tasty beverages and plenty of networking opportunities with local community and business leaders. Stop by and say “hello” and let Fawn help you with your insurance needs. The event starts at 5pm and is located at 6450 1st street, Forestville. For more information click on http://www.forestvillechamber.org. See you there! On Sunday, October 30th Angela and Fawn from Gene Gaffney Insurance, will be attending a benefit for our long time client “River to Coast Children’s Services”. They will be hosting a spooky Halloween Séance at the Santa Nella House and have palm reading, food, wine and a whole bunch of fun and socializing. The event is located at 12130 Highway 116 (between Guerneville and Forestville). For more information click http://www.santanellahouse.com or click here to download the event flier. See you there!